(Bloomberg Opinion) -- There’s one thing we all know about Saudi Arabian Oil Co.: It’s awash in hydrocarbons. The 261.5 billion barrels of crude oil in its underground reserves would be enough to sustain current production rates until 2088, nearly four decades after the point when the world needs to cut its carbon emissions to zero to avoid devastating climate change. In one area, though, Aramco appears to be running oddly short: gas. Saudi Arabia has one-third of the Middle East’s oil reserves, but just 10 percent of its gas. That’s a problem, because it’s already the world’s seventh-largest consumer of the hydrocarbon, and isn’t on best terms with major external sources of supply. 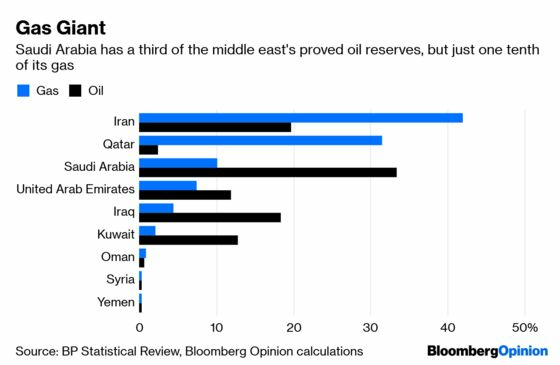 About 42 percent of the region’s gas reserves is controlled by arch-enemy Iran, and another 31 percent held by Qatar, which the kingdom has been blockading for nearly two years. This problem is only going to get worse. Riyadh is switching away from oil-powered electricity generation to maximize short-term crude exports, and is using more gas as an industrial feedstock to aid its pivot away from dependence on a single commodity. As a result, domestic gas demand is rising at 3.7 percent a year — one of the fastest rates among major consumers. Look at where that’s headed and you arrive at some enormous numbers. 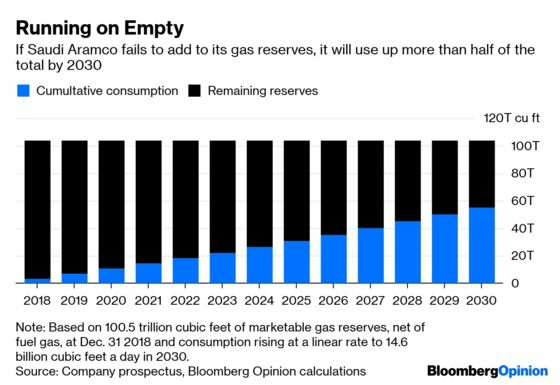 Based on Aramco’s estimate that gas demand will rise from 9.1 billion cubic feet a day in 2018 to 14.6 billion cubic feet a day in 2030, it’s likely to consume in the region of 55 trillion cubic feet by the end of the next decade. That doesn’t sound like much when set against the 283 trillion cubic feet in proved reserves that BP Plc estimates Saudi Arabia is sitting on. But Monday’s prospectus for Aramco’s debut bond sale provides a reality check. The kingdom’s own estimate for its natural gas reserves is 234 trillion cubic feet, not the 283 trillion figure estimated by BP. That alone knocks an Exxon Mobil Corp.-sized hole in the stockpile, but it gets worse. 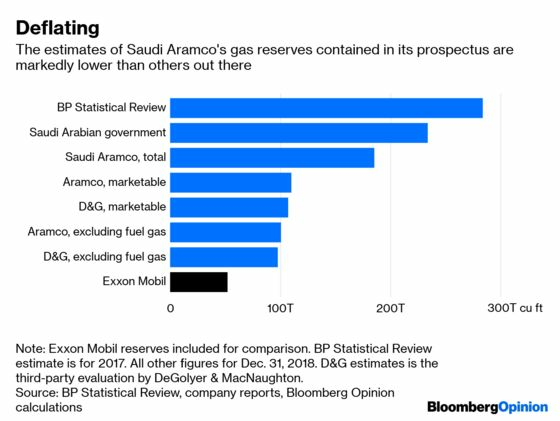 Aramco’s own estimate is smaller at 186 trillion cubic feet, so that’s a second Exxon-sized reserve wiped out with the stroke of a pen. Even that number needs to be discounted, though. Much of that total will never be sold, since it will end up being burned off at wellheads, re-injected into oilfields to extract more crude, or lost at other points in the production process. If you measure only marketable gas reserves, Aramco reckons it has 110 trillion cubic feet. Exclude quantities that will need to be used as fuel in the company’s facilities, and you’re down to 101 trillion cubic feet. Suddenly the gas position of Aramco, and the kingdom itself, to which it’s the exclusive gas supplier, is looking a little tight. Of course, mineral reserves aren’t static. 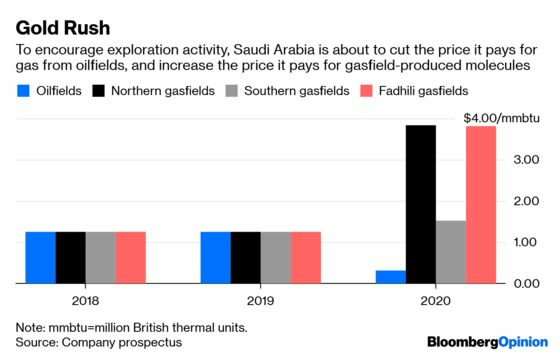 Most of Aramco’s exploration activity is in gas rather than oil, according to Monday’s prospectus, and the $2.1 billion exploration expense last year was the industry’s biggest after the state-owned Chinese and Indian giants PetroChina Co. and Oil & Natural Gas Corp. Most oil majors have a reserve life of 10-15 years on their books, topped up each year with new finds. It’s only when compared to Aramco’s century-long crude reserves that the two decades or so of natural gas looks weak. Last year alone, 4.7 trillion cubic feet was added to Aramco’s gas reserves, and Chief Executive Officer Amin Nasser wants to increase output to 23 billion cubic feet a day and turn the country into a gas exporter by 2030. You wouldn’t bet against Aramco’s ability to achieve that feat. It sits on top of the world’s richest hydrocarbon province, and if its gas reserves aren’t any bigger, it’s at least in part because the kingdom’s crude endowment is so rich that it wasn’t even really bothering to look until a decade ago. At present, the government-fixed gas price of $1.25 per million Btu hasn’t really been enough to incentivize exploration and development. That’s going to change next year, when the price from fields where gas isn’t a byproduct of crude production will increase threefold or more. Still, those inclined to buy a 30-year Saudi Aramco bond on the basis of its stunningly low crude production costs should pay attention to its lighter products. As we found out on Monday, Aramco’s profits per barrel are already less impressive than you might have thought based on its sub-$10 production costs. Finding and developing the offshore and unconventional gas that the kingdom will need over the coming decades won’t be as cheap as sticking another derrick in its giant Ghawar field. Its hunt for gas may well prove to be fruitful — but it’s unlikely to be cheap. The true figure may be higher, since this doesn't include ethane, a major petrochemicals feedstock which is currently consumed at a rate of 1 billion cubic feet a day. However, ethane can be produced from crude oil as well as natural gas, so it's possible that Aramco's ethane production doesn't really impinge on gas demand. Those fields under the waters of the Persian Gulf are the most strategically important ones, since output levels aren’t at the mercy of Saudi Arabia’s self-appointed role as the swing producer among the Organization of the Petroleum Exporting Countries.